Vacation rental house. 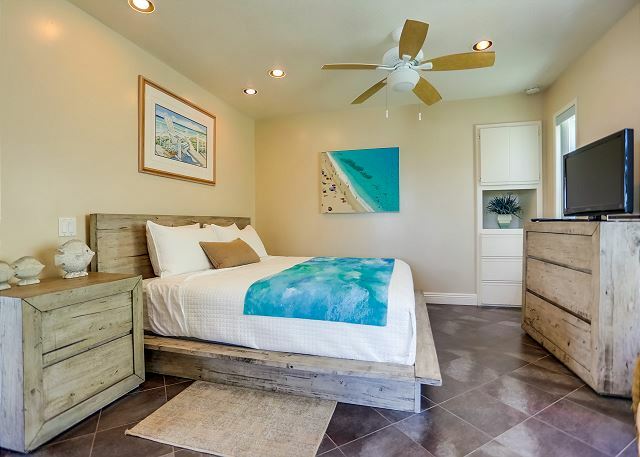 Sleeps 8, 5 bedrooms, 4.5 bathrooms. No pets allowed. Second and third floor condo. Ground floor is a separate condo. 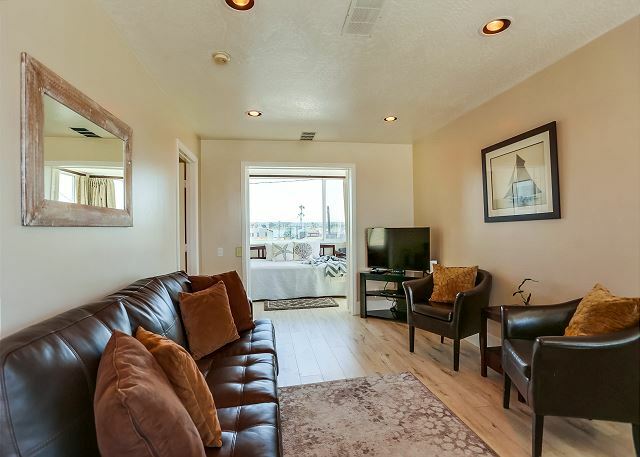 Please note : This condo is located on the second and third floor of an ocean front building. The ground floor is separately owned and occupied. Also, there are neighbors in close proximity to this building, for this reason we cannot allow any large gatherings, parties, loud noise, or disruptive behavior at any time. 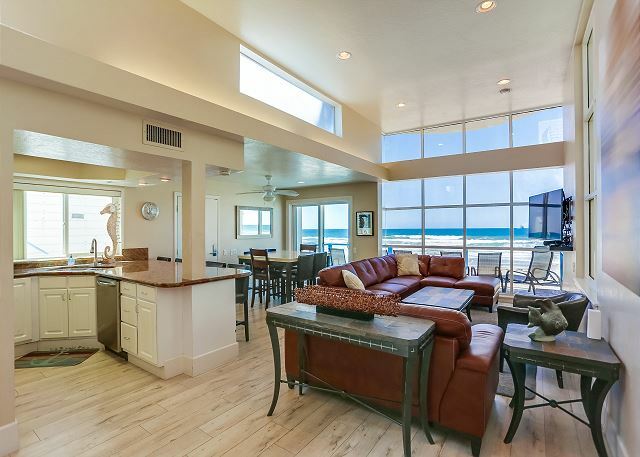 This stunning ocean front penthouse utilizes all indoor and outdoor spaces flawlessly. The five bedrooms, and four and a half bathrooms provide comfortable living for all guests. There are three master bedrooms, one with a King, the two others with Queens. Private balconies are located on four levels resulting in idealistic ocean and bay view experiences. Enjoy morning coffee on the balcony located off the second floor, prepare the cookout with the gas BBQ located on the third floor balcony equipped with dining table and chairs, or lay out in the sun of the roof top balcony. 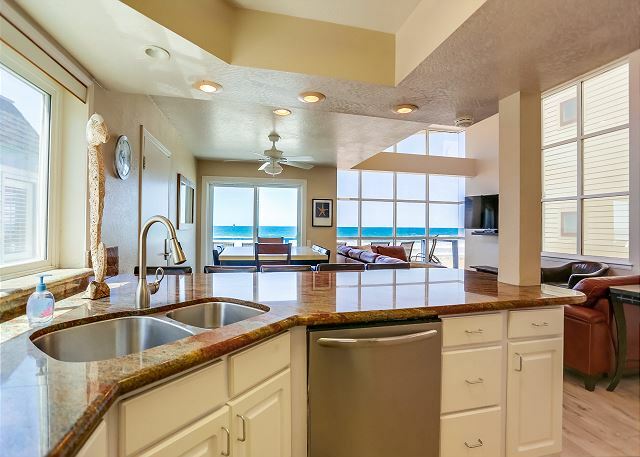 The main living area is an open floor plan with ocean views from the very back of the kitchen, past the dining room to the living room with large floor to ceiling windows. The dining table can seat up to six and the bar can seat up to four. 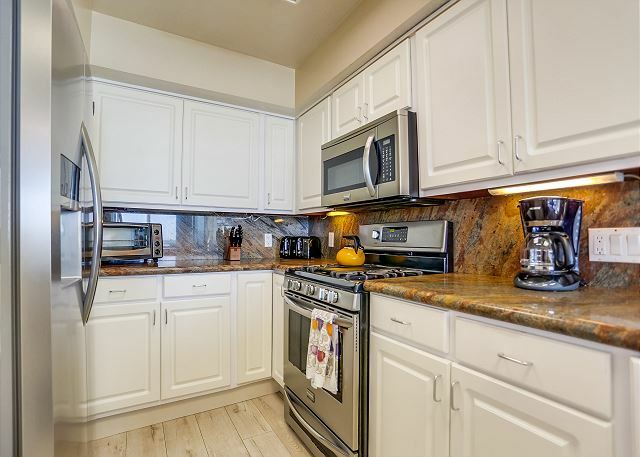 Stainless steel, dishwasher, refrigerator, stove and microwave outfit the gourmet kitchen with warm granite counter tops. Relax on the soft leather couches in the living room while gazing out to sea or watching a movie on the flat screen TV. Three bed rooms are located on the first floor of the condo. Two of the rooms are masters with Queen beds and their own private bathrooms, one of the bathrooms has a large and luxurious Jacuzzi tub. The third room is a Double bed with a pull-out Twin Trundle and upper Twin Bunk. Also a powder room and a washer/dryer are located on this floor. 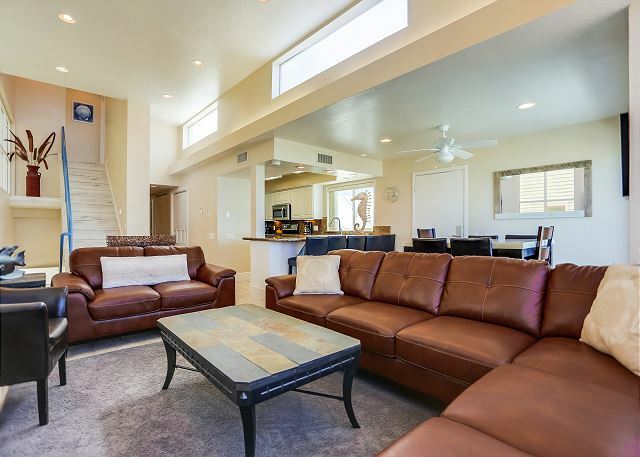 The upper level is a comfortable sitting area with a Queen sleeper sofa, TV, access to the second floor and roof top balconies, as well as a bathroom with shower. 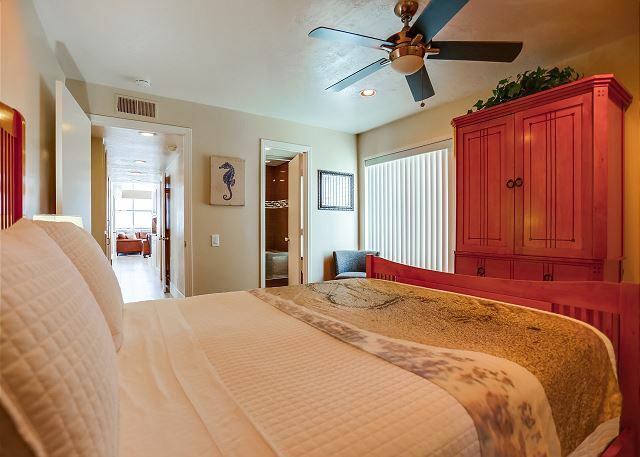 There is a very peaceful top floor master equipped with a King bed accompanied by a private bathroom. Also on this floor is a sun room bedroom with a Double bed, ideal for parents who wish to have children sleeping nearby. Parking is limited throughout the Mission Bay area. There are two parking spaces designated for this property. The approximate dimensions for the carport are as follows 7’9” H x 6’6” W x 17’ L. The outside parking space on the south side of the building has approximate dimensions of 9’Hx7’7”Wx20’ L. Please be sure the vehicle you bring will fit in the designated area. If you have any questions, please use the request more information link above. The Mission Beach and Mission Bay vacation communities are centrally located in San Diego for easy access to San Diego County's most popular attractions including SeaWorld, the World Famous San Diego Zoo, Balboa Park, Seaport Village, La Jolla, Ocean Beach, Downtown San Diego, Coronado, Del Mar and much more. 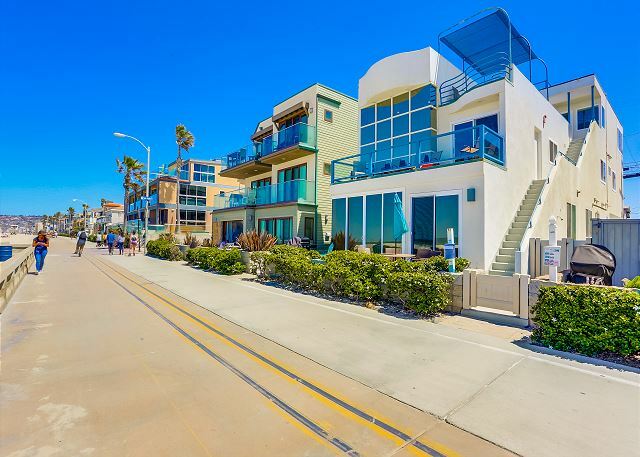 San Diego Vacation Rentals and Realty Consultants offer the most and the best vacation rentals and beach rentals in Southern California. Daily, weekly and monthly rates are available. helped that the weather was fantastic for the 2nd week of February. Thanks again." 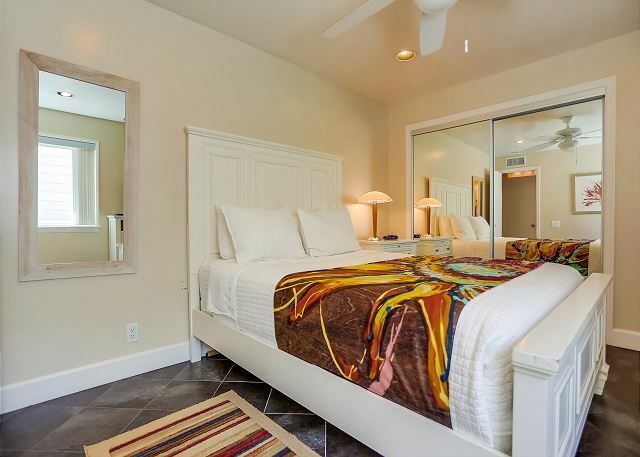 Rooms Sleeps 8, 3 master bedrooms, one with King, Two with Queen. Fourth bedroom has a Full with Twin Bunk/Trundle. Fifth bedroom is on the third floor next to the King master with a Double bed. There is a Queen Sleeper Sofa in the sitting area on the third floor. Great property that we will definitely rent again! Thank you for the nice review. We hope you stay with us again. Thank you for your wonderful review. We hope to see you next time you come San Diego. The home could not be in a better location. It is just as beautiful as the photos lead you to believe. The house was clean, well stocked and perfect for our girls trip. Thank you for the wonderful review. We hope to see you the next time you visit San Diego. Overall great location, windows needed to be cleaned and many outlets were not working. Minor complaints compared to the beautiful scenery on all levels. Loved the decks. Thank you for your nice review. 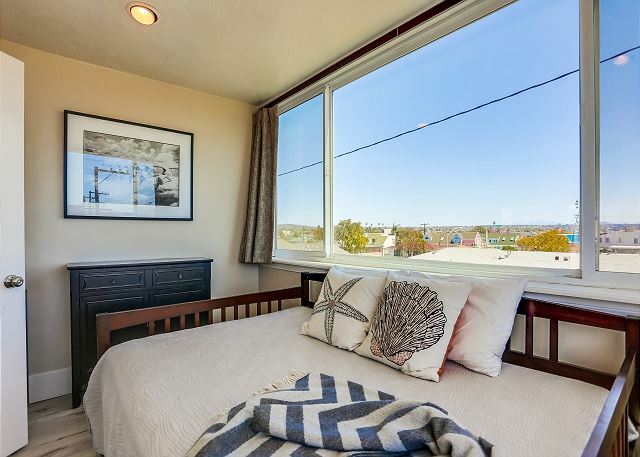 We have taken your comments into consideration and have since cleaned the windows, looked into the outlet problems and have scheduled a spring cleaning of the unit/ Thank you for your feedback and we hope you will look us up the next time you come to visit San Diego. We had a girls getaway at this property and it was perfect in any way. The locations can't be better, walk distance to bars and restaurants. The property is absolutely gorgeous and the price is far! This home was fabulous! The location perfect, the view amazing! The only recommendations i would give would be to have some umbrella's in the unit to give you some shade, we all got rather burnt and i know this isn't possible but air-conditioning would help. The back rooms get a little warm and stuffy so we definitely used the fans. Also there was a baby gate in one of the closets, there were games in the cabinet in the hallway and we even found a pack-in-play all of which were were told the unit didn't provide. Good things to know when your coming to the unit with kids. All in all, probably the best place we've stayed in yet! Great Condo on the Beach!! We have stayed at two other Mission Beach rentals - the other two on the Bayside and this condo was worth the extra cost! Wow, the views from the 3 different level decks were spectacular, especially at night! And the layout of the house was SO comfortable - the kitchen accommodated 1-2 people; the bedrooms were all very comfortable. It was a great location to take walks on the boardwalk, go to the beach, sit out on the decks and people watch. Definitely a memorable experience for our entire family!! Second Time Renters and Still Completely Satisfied! This is the second time we have rented this particular unit. House is still in great shape and is clean, spacious and a PERFECT location! Very close to shopping, bay, Belmont Park etc... I would highly recommend this beach house for any occasion! We had NO issues whatsoever. It was fabulous for our large family reunion. Perfect location. Loved the three decks. As always 3587 Ocean Front Walk was clean, comfortable, and a lovely venue for our family. We are very appreciative of the opportunity to spend our beach vacation there. This was our second year booking this rental for our annual family vacation. We have already submitted the paperwork to secure it for next year! 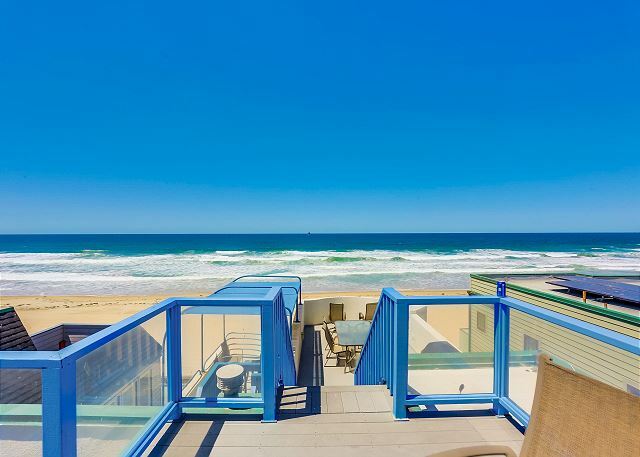 This spacious penthouse alongside the boardwalk provides the ability to enjoy the beach 24/7. 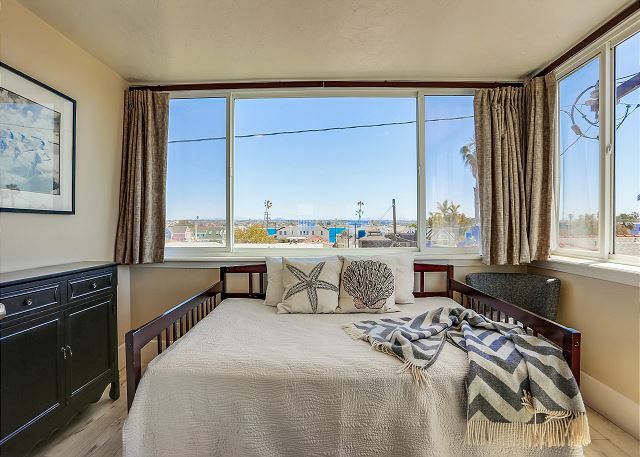 Walking distance to all things that Mission Beach has to offer. We had a great time. The location was great, parking was a little tricky, but we made it work. House was awesome with amazing views. Would stay here again. Fabulous location right on the beach and the boardwalk. House is clean and well set up for a beach vacation. It is a bit pricey but you are right on the beach. We hope our family can make this happen again in the future. Wonderful large house. A couple of items to note. One of the chairs was broken and my daughter almost fell off. Upstairs shower is backwards in the the hot is actually cool. Minor issues for this rental. Cannot say enough good things though. Lived up to its reputation, which is always excellent! Every aspect of our stay was excellent, as usual. When we reported a fluorescent light had gone out your repairman was there to replace it within a few hours. The cleanliness was impeccable as usual. Very impressed with the new family room furniture as well. All good!!! A great rental property. Worth every bit of the cost. We were lucky to have found this property and it be available to accommodate our large family group of 4 adults and 5 children. Perfect amount of room for everyone, and the location can't be beat. We would stay here again in a heartbeat. Only thing to keep in mind is not all the outlets on the upstairs decks work, which we discovered when trying to put together a dinner party one evening. Other than that everything is exceptionally well kept. This house is a gem. We brought our family to San Diego for a family vacation and LOVED this property. 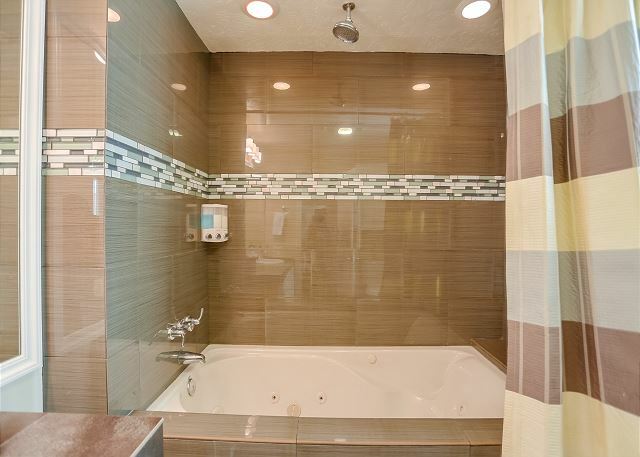 Plenty of space and bathrooms.. CLEAN.. and the location were perfect. Great being on the boardwalk. Also the house was more than expected stocked.. nice dishes, silverware, towels and beach accessories! Couldn't have asked for a nicer place!! Beautiful location and great layout! We hope to be back next year. Thank you for your kind review. Please contact us anytime to process your reservation for next year. We may be able to offer a repeat guest discount depending on length of stay and time of year. Great location; Great house; Totally lived up to the pictures and earlier reviews! Great Location, House and Week! We were a family of 8 adults and 3 children. This place could not have been nicer. Very clean upon arrival, location was wonderful. We never felt cramped, plenty of room for everyone. Parking can be a bit tricky. It was great to have 2 parking spaces available - they are tight-but if you read the description - you have been forewarned. We loved our stay and the staff we worked with at SDVR were wonderful. Definitely would stay here again. This house was perfect for our extended family getaway. It easily handled four couples as well as 4 kids. We loved the location and the view! Kitchen was well stocked. Nice to have 2 parking spots- although they were small for our mini van. All in all, I would definitely stay here again!! 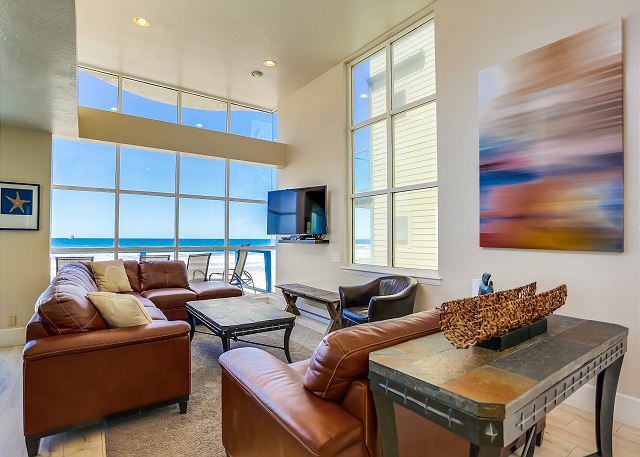 We had a great experience at 3587 Ocean Front Walk in January. Our family of 4 stayed with another family of 6 at this location and had a wonderful time. Can't beat the location, and setup of the property. Adults hung out on the patio while we watched the kids play on the beach. Would highly recommend to anyone visiting SD. We were staying with a group out of 9 people and it was a great vacation for 4 nights at mission beach! The pics on the homepage do hold the promise more than expected: a great view on the ocean balkony and the rooftop are perfect for dinner with the big group. The quality of the facility at all is also very good. Great trip! House is perfect for multiply families, privacy is available on each floor and the views from upper decks are amazing. You can even see fireworks from upper deck.. Lots of stairs though! The property is lovely and fit our family needs perfectly. We especially liked the outdoor terraces where we could look at the ocean and relax. There were some problems with flies from the trash barrels which probably could be remedied with washing out the barrels more frequently. This was the most relaxing vacation we have had in some time. SDVR was very professional from start to finish. The staff is amazing. We loved our house. The pictures we saw online prior to booking were amazing but you never know what you are going to get until you walk in and it was just like the pictures. Absolutely beautiful! Fully stocked kitchen with all the utensils and plates and accessories for cooking. Rooms were very spacious. House was exceptionally clean. Location was perfect Best vacation we have had in a long time. Kids enjoyed it! Would highly recommend it! Best vacation home away from home! We have been coming here for many years and consider it an excellent choice for a great family beach location. Always prepared well to greet us and if anything becomes unworkable there's always a quick fix! 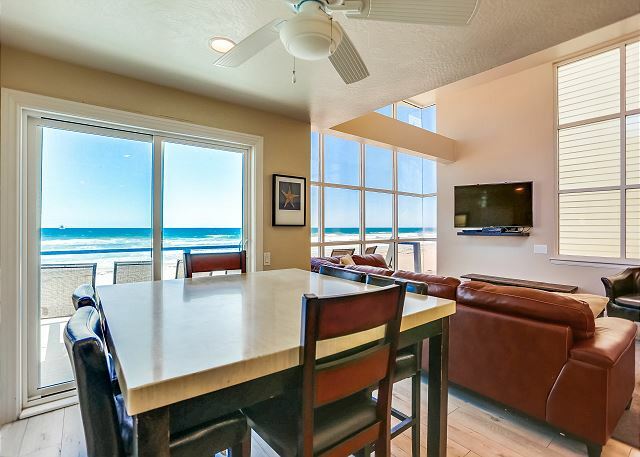 We rented this home on Mission Beach for a group of 10. Never felt crowded or cramped, spacious roof deck with unforgettable views. Property was very clean and in perfect condition. We rented boards and bikes and we able to store them onsite for the week. Thank you for your kind review, we are pleased you have enjoyed your stay. Please contact us again for your San Diego Vacation Rental. Home wss lovely and the only only issue is that the bed pillows were not great. Everything else was wonderful. Would rent from them again and the process was seamless. Thank you again for a wonderful family time. All went very well and easy. The house was in great shape and the rental company seemed well run. We had a great time on the pristine beaches at Mission beach. Walking distance to restaurants and attractions. Good central location along the ocean walk. Plenty of space and had almost evrything we needed for a week's stay. No beach towels, just bath towels in the house. Was great except wi fi did not work. Very nicely equipped home with beautiful view. 2nd floor shower handle broken and needs replacing though. The house was awesome! Great View, very clean, and spacious. We had a great time. The facility was wonderful, but I would add 2 caveats. The wireless service was limited, which was not a big deal. The roof top levels were great, but the angle of the stairs were quite steep and not well light. Perfect setting for our family. Plenty of room for everyone at an unforgettable, gorgeous location. Very satisfied with the condo. Only one incident, with a loose towel bar which was quickly repaired. Condo was exceptionally clean upon arrival. All appliances were in great condition as well. There were 8 of us total, 3 couples and 2 kids. There's plenty of sleeping options. The 3rd floor alone can easily sleep 4-6!! Amazing views, multiple balconies is a definite plus. Being near tower 18 is nice, the beach isn't nearly as busy. Parking is very tight, but it works. We will definitely rent again! Overall we enjoyed using the property. What we wanted was close access to the beach and boardwalk and we got that. We were 5 adults so we had a few challenges.. One bedroom has bunkbeds with large twin or double on the bottom. I put my 6'3", 250lb frame there.. Another 'room' is actually an alcove with a Murphy bed.. which one of us was quite upset with. The other 3 enjoyed their rooms greatly..
What a great condo, we have stayed in this exact rental a couple times. The property was in great condition and was impressed with all of the new finishes. You cant beat the 360 degree view of San Diego either! We will be back for sure! This was our 19th year to rent this particular unit. I think that says it all. Clean and in decent working order. Michelle handled any issues promptly. As always, the condo was clean and convenient for our family to enjoy a week at the beach. The property was extremely clean and was in a great location!! Beachfront unobstructed 360 degree biew from upper deck. Great place. This place sleeps 14 or 8 former and retired Marines. I was the only local and the rest of the guys were from the Midwest and east coast and they loved it and the area. Very comfortable place. It was hard to leave and go to other places in San Diego because you want to enjoy every minute of the "Entertainers Dream". The only downside is the parking and there were a few dirty dishes in the cupboard. Highly recommend this place and SDVR. Great people and very helpful. Rented this property for my 30th birthday. We rented both levels and allowed us to have 23 guests stay at the house. It was a perfect rental for such a large group. My only complaint is that the top deck outlets didn't work and there are no lights up there at night to see where you are walking. Aside from that the rental is great for hosting parties and large groups. This property was excellent. We had 4 adult couples that vacation together every year and this property provided all the amenities we were looking for. The bedrooms and bathrooms were clean and large. The kitchen was great as well as the living room and dining room which was very conducive to all the card playing we liked to do. The patios were outstanding and the location of the property on the boardwalk was absolutely perfect. We are in fact looking at returning next year for our next trip. Rental company was professional and easy to work with. when we arrived at the property it was clean and in good condition. The property is in a perfect location with 3 different balconys with a great view. Plenty of accomadations in close proximity. Highly recommend this property on your next beach vacation. Highly Recommended! Great time. Will definitely rent this house again! Thank you very much for taking the time to review our property and services. We appreciate your business and hope you will recommend us to all your family and friends!! We rented this beach house for out-of-town family attending our son's wedding in San Diego. The location, views (from 4 decks and every room), the layout and the decor was all fantastic! We walked, surfed and thoroughly enjoyed the beach right outside our door. No one will ever forget the wonderful time we spent at 3587 Ocean Front Walk in Mission Beach, October of 2012. Fabulous location that was perfect for our family. Timely repair of broken TV and plugged up sink. Office staff are great. We will be back. This was our Fiftieth Anniversary Celebration and we brought our family to San Diego, mostly from the East Coast. We were happy to find that the house was clean, comfortable, convenient and well-equipped. The newly-remodeled kitchen had everything we needed for some great meals and had enough room for easy preparation of the meals. The many seating areas and comfy furniture suited all ages. The teens in the group loved being on the prom and loved the views from the decks. The beach equipment added to their fun. The property is well-maintained and the cleaning people made sure we had everything necessary, especially lots of extra towels. If we could make any suggestions, we would suggest extra kitchen towels. There were plenty of extra blankets and pillows, but it would be good to have covers on the extra pillows. The grill was a real plus, however, you might check and replace the heat deflectors to make the grill's use even better. Overall, we had a wonderful experience. Enjoyed every minute and came home with wonderful memories enhanced by having stayed at 3587 Oceanfront Walk. An excellent choice for our family vacation! As I discussed with you at the end of our stay, we were very impressed with the cleanliness of our unit, especially the linens. After many years with SD Vacation Rentals, we do not hesitate to recommend you to family and friends! I hosted a large group from all over the country at The Entertainer's Dream, and that was exactly what it was. Greatful to have avoided the "May Gray" we spent the days either lounging on the rooftop patios or just across the Boardwalk playing games. As the evenings closed in the close proximity of both Pacific and Mission Beach social areas was great. No cab's needed just a nice stroll down the ocean front walk. Amazing times had by all. Our experience over all was wonderful. 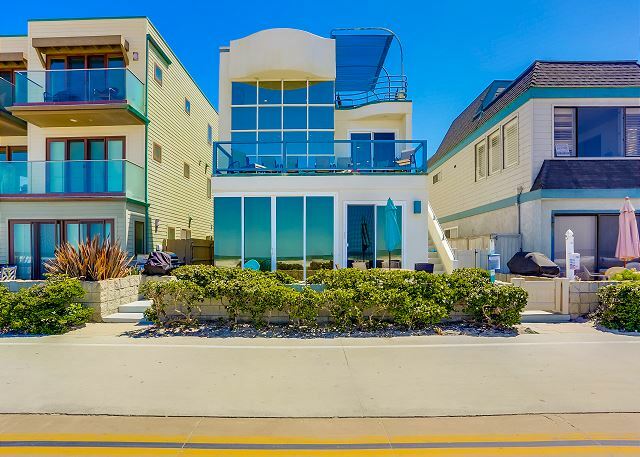 This house has a great location on Mission Beach. The place has 4 queens, and one of the queens is actually a bunk bed, which was unexpected, but was fine. The 5th bed is a murphy bed that was upstairs with the master. The murphy was comfortable and was private enough that it is fine to sleep two people comfortably. Be carful if you are renting two cars (or more). The parking is on premises, but is tight. I wouldn't do anything but a compact for either space. We had about 12 people come in from both coasts for a friends birthday and loved staying here. The weather wasn't ideal since it was April and it's a crapshoot at that time of year, but even with grey skies and some rain, you couldn't beat the view and the location. I'd stay here again. Wow! Great location on mission beach. Accomodated our large group of 12 very comfortably. Had all basics (even a playpen). Felt larger than the mentioned square footage. Decorated nicely. We would book this home again! San Diego has so much to offer and 3587 was perfectly located for us to access all the activities offered while also being able to take in wonderful Pacific Ocean Sunsets, Surfers and Dolphins. We had our entire family with 4 young grandchildren and the space allowed us to relax and enjoy watching them have fun. what a amazing house and great service. The location and condition of this property is first class. The transaction and service was above my expectations. I could not believe how easy the management company made the check in and out process. This is like renting a car from Hertz gold. You show up walk into the house and never have to deal with any paper work or ****. I have rented before and the check in and out process took valuable time from our vacation. Not the case here. They made sure everything was perfect without being in our way. I would definitely recommend this property to anyone I know and this rental company. SDVR does it right and makes it easy. Thanks for a perfect house to make a perfect beach vacation for my friends and I. Had a very good stay.